The 19th Annual Stetson International Environmental Moot Court Competition, is one of the prestigious mooting competitions among all National and International moots. The competition was conducted from April 16-18, 2015. There were four teams from India and performed excellently in the International rounds. The teams were from NLU Jodhpur, NUJS Kolkata, NALSAR Hyderabad and RGNUL Patiala. The annual competition was held in Stetson Law School. There were 13 teams from across the across the world including U.S., China, India, Ireland and the Philippines. The team from NUJS Kolkata constituting Sagnik Das, Dishi Bhomawat and Arundathi Venkataraman finished as quarter finalists at the tier 2 moot court competition. At the quarterfinals Sagnik Das accomplished to be the best speaker and Arundhati Venkatraman was adjudged as the 4th best oralist. The National rounds were conducted on November,2014 at University of Jammu, where Sagnik had won the best speaker award. Team: It feels very good. Both of us got speaker awards at an international stage and we feel that our hard work for many months has paid off. That aside, the moot itself was quite an experience. Having qualified from India and earned our ticket to Tampa, it felt great to get laurels for our college. LiveLaw: What was your motivation behind opting to do this moot? Team: Both of us have had previous experience with Public International Law and are extremely interested in PIL. We had done the Jessup moot together, the year before and thought that Stetson would be a very good experience as well. 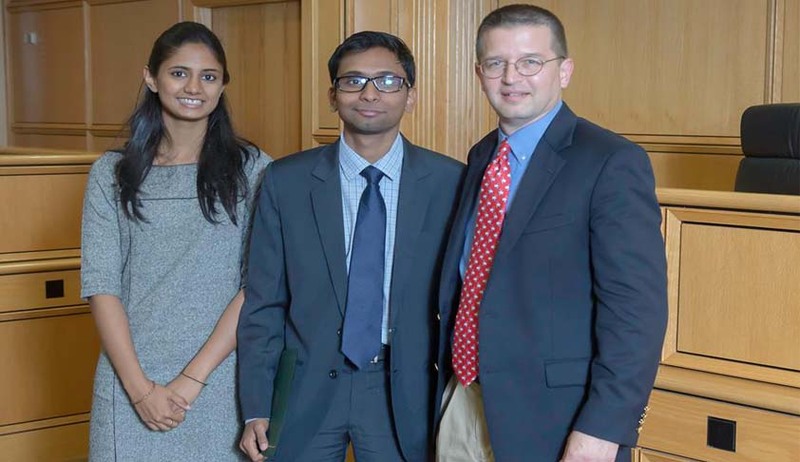 LiveLaw: What made Stetson International Environmental Moot Court Competition different from other National and international Moot Court Competitions? Team: For one, the subject area is very niche. International Environmental Law is one such area which is extremely fertile and very interesting, much like PIL itself. Stetson as a moot therefore appeals because of its niche area. The moot is also quite spaced out and hence, less hectic for students, especially if teams work consistently through the 8-10 months. One thing that I really liked about the moot was that it was very well organized. The organizers were very hospitable and really helpful throughout. LiveLaw: What is the most important thing you learnt while preparing and competing for this moot? Team: That it is extremely crucial to be thorough with understanding the basics of the subject area of a moot court. Almost always, most teams are well-researched. What however, separates good speakers from the others is how well they know their basics. Perhaps, it is also of equal importance to strategize well as a team. It is important to give up weaker arguments in orals and stick to the stronger ones. While participating at the moot, we learnt a lot, especially in terms of adhering to the spirit of competition at all times. I remember that we beat this one team from Symbiosis Pune in our national rounds, and they helped us a lot in our next rounds and cheered for us all the way. We ended up becoming really good friends with them. Even at the international rounds, the team we lost to eventually were very good to us even after beating us. They gifted us chocolates in fact! Team: The national rounds had some really tough competition. It was rather tricky to cross them and qualify to the international rounds. LiveLaw: Did any one of you felt like giving up at any point of time? How did you guys motivate each other? Team: I think both of us were very motivated throughout. We had been in a moot team together before and have worked together, so keeping each other motivated wasn’t very difficult. During the months of October-November, close to the national rounds, the going did get rather difficult. We had a lot of academic commitments to balance and college studies to manage. I think a lot of times we covered up for each other on the team and helped each other out with our respective issues for the moot problem. Most of all, it helped that we had a very good friendship off the team as well. LiveLaw: How did you come up with fantastic team? Team: Purely by chance. We had an inter-college intra moot court competition and based on our ranks, we got this moot. LiveLaw: What strategy did you adopt for your preparation? How did you divide your work? Team: We divided the issues amongst the three of us. The moot problem had two issues. One of us worked on the first issue, with our researcher. And the other (Arundathi) did the second issue by herself from both sides. We started preparing for the moot in April last year, by reading up on basics of public international law and international environmental law. Then when the problem came out, we started with researching on the issues and drafting our memo. Our speaking practices started only in the last week of November, after the memorial submission. LiveLaw: What about the support from your institution and faculties towards this achievement? Team: We are always thankful to our college professors and the administration for their support in such endavours. Some of our college alumni who were earlier our seniors in college, and who had participated in this moot previously, really helped us out, with respect to the memorial drafting as well as speaking styles. LiveLaw: How many National and International Moot Competitions have you participated and won before? Team: Well, I (Sagnik) have participated in the Philip C. Jessup Moot Court Competition previously. This year finally we reached the world rounds (at Washington DC) of that moot as well (which happened in the first week of April, before Stetson). We were Octo-Finalists there. She (Arundathi) has enjoyed quite a fair bit of success in the mooting world. She was finalists at the NUJS Herbert Smith National Moot Court Competition and was the Finalists at the World Rounds of the Red Cross Moot Court Competition (Henry Dunant), held in Hong Kong. She has also participated in the Jessup moot. LiveLaw: What area of law would you guys like to gain expertise in? Has this moot helped you identify any other weak area of yours to work on? Team: Both of us are academically very interested in Public International Law and would really want to gain more experience in that area. We would surely love to pursue higher studies in the different areas of Public International Law at some future point of time. I am sure for both of us, Stetson has been pretty instrumental in furthering our interest in PIL. That aside, I (Sagnik) am interested in International Economic Law as well as Family Laws. Arundathi is very interested in Dispute Resolution and IP laws. LiveLaw: How did you balance your academics/internship with the preparation for the moot? Team: That was the most challenging part. We were in our fourth year and the moot was very near the time that our placements happen. So it was quite the task to balance academics during the semester and internships during the vacations, alongside the moot. Like I said, a lot of times, we covered up for each other. The moot was spaced out over a long time of 8-10 months and we ensured that we were systematic and timely with our work, so as to be able to balance everything. It was important to stick to our internal deadlines within the team and all three of us did that. Team: Right now, both of us will be joining law firms and we would whole-heartedly be pursuing a career there, after law school. LiveLaw: How was the experience working with your team? What were your team’s fortes? What roadblocks did you face? Team: It was an immense pleasure to work with the team. We had our fair share of fun, but the best thing was that we had a very good professional relationship. If I were to point at one particular forte, it would surely be that all three of us had previous experience with international moot court competitions, and we knew very well what was expected out of us, and exactly how taxing it would be, in terms of hard work, and we were prepared for it. Sometimes, we did feel that we would be better placed if we had more resources in terms of the books and the online materials that were available to us. That is actually a problem a lot of Indian teams face. The lack of available/accessible resources (especially on something as niche as shark finning) was definitely a big roadblock. But I guess we managed to do the best we could with whatever we had. We had some good guidance from a couple of college seniors/alumni as well. LiveLaw: Most questions of the moot came from which area of Environment law? Team: The legality of shark finning and trade restrictions based on public moral concerns over humane animal treatment. LiveLaw: How many teams did you compete with? Which team would you consider your toughest competitor? Team: There were about 30 teams in the national rounds. In the national rounds, we had two prelims, pre-quarter final, quarter finals and semi-finals (where we lost eventually). The international rounds had four preliminary rounds, with a break to the quarter finals (where we lost to the University of Hawaii). I think our toughest match was against Ateneo De Manila College from Philippines in our fourth prelim round at the Worlds. It was a really close match, which we narrowly won on orals, but lost on memorial scores. LiveLaw: What according to you helped you get into to the quarterfinals? Team: An extensive number of speaking practices. I thought that the fact that we did a number of practice oral rounds before both the national and international rounds, held us in very good stead. Team: That statement is very correct. Often, a very good speaker, is only as good as the memorial that his team has. But I still think that memorial drafting and speaking are two very separate aspects of a moot. A lot of times teams with not-so good memorials, win moots solely because their speaking is excellent. A good memorial is always a big advantage. But a lot of rounds are won just on speaking. That is especially true in Stetson, because the oral round judges do not get a copy of your memorials when they are sitting to judge you. LiveLaw: What message would you like to give to the mooters and non- mooters out there? What is your advice would you give to fresher to mooting? Team: We don’t really think that we can offer any advice with respect to mooting, that hasn’t been said already. But everyone should try it out once. It’s a great learning experience and prepares you well as a prospective lawyer. For mooters, I think the cliché holds good that every person on the team should feel that it is his/her personal responsibility to lift the team and see the team through all its highs and lows, to the very end. It’s important to have an insatiable desire to keep reading and researching on areas of the moot problem, till the last day and till the last round of the moot.